The Bureau of Labor Statistics said wholesale inflation rose in February, boosted by another bump up in energy costs. Year-to-year, the Producer Price Index rose 2.2% the most since March 2012. Excluding food, energy and trade services, the core rate grew 1.8% over the previous 12 months, suggesting wholesale prices are rising near the 2% inflation rate sought by the Federal Reserve Board. With consumer spending accounting for more than two-thirds of economic output, the Commerce Department’s report on February retail sales showed shoppers letting up after a strong January. Sales rose 0.1% for the month, with only five of 13 retail categories reporting gains. Car dealers were among the decliners, along with gas stations and appliance stores. Year-to-year, retail sales rose 5.7%, down from the long-term average of 4.3%. The broadest measure of inflation also showed signs of year-to-year economic growth in February. The Consumer Price Index gained 0.1% for the month, the slowest gain since July, held back by a 3% drop in gasoline prices. Excluding the volatile food and energy items, the CPI indicated a 12-month inflation rate of 2.2%, staying in a narrow range that points to a sustainable pace of economic expansion. In a sign that companies continue to try to keep supplies in closer alignment demand, business inventories fell 0.3% in January while sales rose 0.2%. The Commerce Department showed the ratio between inventories and sales remaining about where it was two years ago, suggesting companies are in a better position to respond to increased demand with more production and employment. The moving four-week average for initial unemployment claims rose for the second week in a row after hitting the lowest level since April 1973. Data from the Labor Department showed jobless claims 34% below the 50-year average, where they have been every week for more than four years. The apparent reluctance by employers to let go of their workers suggests a solid employment market, which can fuel consumer confidence and spending. The departments of Commerce and Housing and Urban Development reported a rise in the annual rate of housing starts in February, as single-family residences started at the fastest pace since October 2007. Building permits slowed in February because of declines in applications for multi-family units. Both activities have been hovering around pre-recession levels. Job openings rose 1.6% in January, staying around 5.6 million positions, according to the Bureau of Labor Statistics. The number of employees hired rose 2.6%, and the rate of workers quitting their jobs reached the highest point since late 2015, suggesting workers’ confidence in their ability to find another job. The Federal Reserve reported that industrial production was unchanged in February, even though manufacturing output hit its highest reading since July 2015. Unseasonably warm weather in parts of the U.S. affected utilities production. Capacity utilization, an indicator of inflation prospects, declined slightly for the second month in a row to 75.4%. 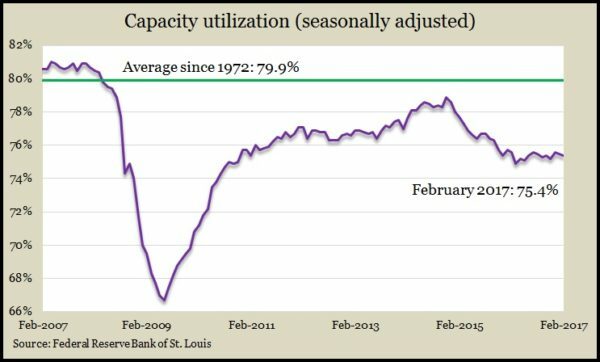 Manufacturers, miners and utilities haven’t been below average capacity since May 2008. A preliminary reading of consumer sentiment for March showed even higher regard for current economic conditions, the University of Michigan reported. Expectations – which fuel consumer spending – also grew, but survey researchers noted a political divide between consumers who are more optimistic about the future and those who are more pessimistic. The Conference Board said its index of leading economic indicators rose in February for the sixth month in a row to reach the highest point in more than a decade. The business research group said that among its 10 indicators, only building permits suggested anything but continued moderate expansion for the U.S. economy.